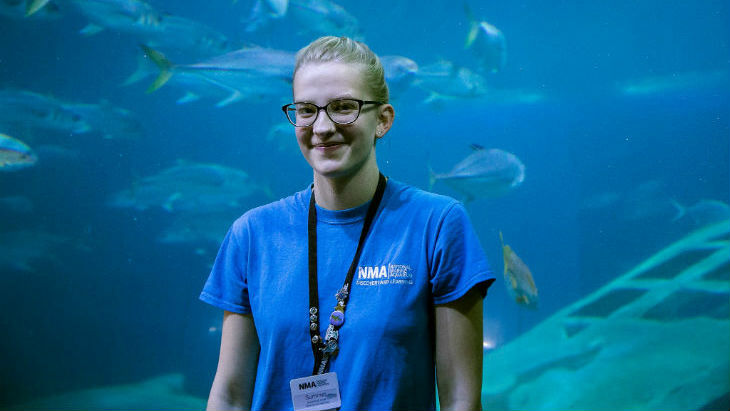 Meet Summer, the UK’s first ever World Oceans Day Youth Council Advisor! We asked Summer, one of our NMA Hosts, to talk about herself and her fantastic news. “My name is Summer Snell and I live in Plymouth, England. I have a huge passion for the Ocean and its inhabitants and strive to conserve our ocean in the best ways possible. Recently I applied for a position on the World Oceans Day Youth Advisory Council and was very fortunate to be accepted. Here’s a little bit about me and what I’ll be doing! The World Oceans Day Youth Advisory Council is a council dedicated to inspiring and connecting young people around the world on World Oceans Day. Their goal is to create a better future with a sustained, healthy ocean that benefits all societies. As part of this council I would be represent the council at conferences and develop a project to implement on World Oceans Day, amongst other things. I am very fortunate to have this opportunity and am incredibly grateful to be selected. On behalf of everyone here at the National Marine Aquarium we’re hugely proud of Summer and her achievement!